You are here: Home / Chapter 7 Bankruptcy / Is My Chapter 13 Bankruptcy Case On The Verge Of Dismissal? 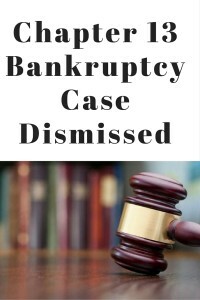 Is My Chapter 13 Bankruptcy Case On The Verge Of Dismissal? This is a question that comes up on nearly every chapter 13 bankruptcy case that is filed. It is almost impossible to make it through the chapter 13 filing process without some sort of difficulty. The difficulty might stem from the trustee, a creditor, the regulations, or the debtor himself. There are certain situations where a case cannot be confirmed by the trustee because the debtor has not satisfied the requirements of a confirmable plan. This could be based on the debtor’s inability to substantiate specific expenses, provide documentation for certain debts, or from the debtor’s inability to comply with the law. A debtor often will find motions to dismiss filed by the trustee when in fact the case is nowhere near dismissal. The typical scenario is as follows. The debtor will file a chapter 13 bankruptcy case and will begin to make payments to the trustee. The debtor will then appear at a 341 meeting of creditors where the trustee will examine the debtor under oath. There may be amendments requested by the trustee upon the debtor’s attorney. The meeting will typically end with the trustee making specific recommendations or requests of the debtor and debtor’s counsel. The case is then set out for a confirmation hearing approximately 30 to 45 days after the 341 meeting of creditors. If the information that the trustee is seeking is not provided in a timely manner, then the trustee will file a motion to dismiss which will be set for the same date as confirmation. I always advise my clients that as long as they are making their payments and as long as they are complying with the trustees requests, the case will not be dismissed. However, a notice of the motion to dismiss is sent to the debtor in the ordinary course when the trustee files it. This is the type of information or documentation that will lead a debtor to believe that the case is going to fail. The most common reason why a case will fail as far as the trustee is concerned is the debtor’s failure to propose a plan which is confirmable. The plan must provide for specific creditors over a series of years. The trustee wants to ensure that the debtor is putting all of his disposable income each month towards the repayment of his debts. The trustee will analyze the budget to determine whether or not the income and expenses are accurate and whether or not the filing complies with the specific sections of the Bankruptcy Code under Chapter 13. If the debtor has good counsel, then the debtor does not have to worry about compliance with the bankruptcy code. The debtor just needs to commence making timely payments to the trustee and to any creditors that are being paid outside of the bankruptcy such as a current mortgage or a current vehicle payment. Most debtors who are employed are put on payroll control. Payroll control is where the trustee payment is taken directly out of the debtor’s paycheck. The odds of success when a debtor is on payroll control is significantly higher than when the debtor is making direct payments. In my office, if a debtor is gainfully employed and payroll control is available, then the debtor must be on payroll control. There are a few exceptions. However, they are unlikely. The reason why we insist on payroll control is that it greatly affects the ability of the debtor to succeed in the plan. It also lets the trustee know that the debtor is serious and committed to the plan. Too many cases from other law firms are dismissed for the debtor’s failure to make timely plan payments. We want to make certain that if the case fails, it is not because the debtor failed to make voluntary payments. If a case fails in my office, it is typically going to be from some catastrophic event such as an illness, injury, divorce, or the most common, job loss. For more information on chapter 13 and how you can rest assured that you are going to have success with your trustee, you can contact my office at 847-520-8100. Our group of experienced, chapter 13 bankruptcy attorneys will lead you down the proper road for success. Additionally, you can look at the reviews that you will find on Google which talk about the experiences that people have had with my firm. You will see that the office returns calls, is diligent in their work, and is extremely knowledgeable and experienced in the bankruptcy process.